There’s nothing standing between you, your vehicle, and the open road winding ahead. The windows are down, the gentle breeze is tickling your cheek, and you’re singing along with the radio that is blasting your jam. Life is great. You’re doing what you love: driving. Your only wish is that you could fall into a career doing something that makes you as happy as driving. Hey! Here’s an idea for you. What about a career as a truck driver? Truck driving is one of the steadiest jobs out there and there just so happens to be a shortage of qualified drivers that are up to the task. And, truck driving will never be outsourced so as long as consumers continue to purchase merchandise, there will be a need for drivers to transport the goods to their destinations. 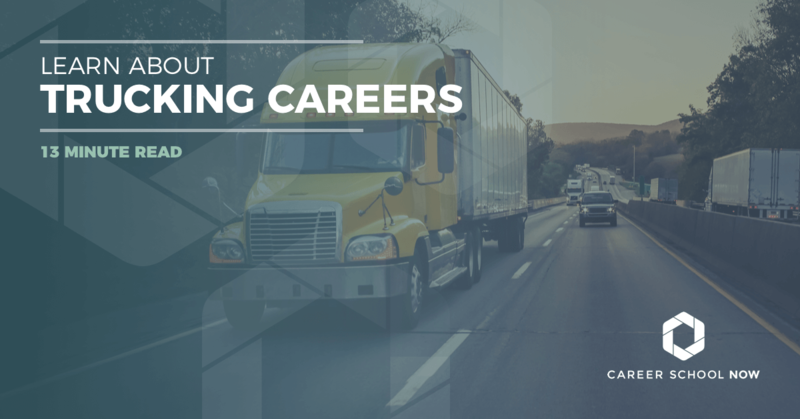 The need for qualified truck drivers is in high demand so if you’re looking for a stable job, a career in truck driving could be the one for you. Get your CDL from a school near you. If becoming a truck driver seems like an attractive job prospect, you’ll need to know some things that are involved in getting from point A to point B. First of all, you need to have a high school diploma or a GED. To travel within your state, the age requirement is 18. But, if you want to be able to drive across the country, you must be 21 years of age. You must also have a pretty good record. You should have excellent vision and hearing, hand-eye coordination, and be in top physical health. The federal regulations will not allow for the hiring of people with any type of medical problems, such as heart problems, epilepsy, or any other condition that would interfere with trucking abilities. You must be able to hear a whisper from 5-feet away whether you have a hearing aid or not, and you must have 20/40 vision with a 70-degree field of vision in each eye. Most schools will require their students to get a physical exam before entering class. Because most companies expect their drivers to be qualified, you’ll need to attend truck driving school in order to become a professional, unless the company you’re applying with has their own training. Most companies prefer their truckers to have gone through the training class. In truck driving school, you will learn how to drive a variety of different trucks on an even larger variety of landscapes such as mountainous roads, hills, highways, and extremely crowded streets. All of which are important aspects of trucking because every route to each different destination could be a combination of all the above and it’s paramount to the profession to know how to navigate every possible condition. The drivers will also be schooled on the federal laws governing the trucking industry, which are equally as important as knowing how to drive a truck. These regulations were put into place to protect the drivers due to the fact that trucking takes a physical and emotional toll on a person due to the long hours behind the wheel. There is usually one week spent concentrating on preparing for the CDL exam. Local truck driving school, whether it’s taken at a private school or through a community college, typically lasts 3-6 weeks. Once the program is completed, a certificate is awarded to the student. Truck drivers must have a CDL or commercial driver’s license, specifications for this vary by state but the common factor is that the driver must pass a knowledge-based test, as well as an actual driving test to be qualified. If the driver has a suspended CDL in one state, other states have the option to refuse to allow the driver a CDL, as well. To obtain your CDL, you must have your social security card or proof of legal presence in the United States, complete an application proving you meet both medical and driver qualifications, have an eligible driving record, and pass the knowledge based CDL test as well as the vision test. There is also a skill-based test taken with a supervisor. If you don’t pass the knowledge based test the first time, you must wait 24-hours before retaking it. Once you’re hired, expect between 1-3 more months of on-the-job training. During this time, you’ll be mentored by a more experienced driver where you’ll learn about the exact type of rig you’ll be driving. Chances are, you will be sitting in the passenger seat but sometimes the mentor will do the mentoring from that seat, instead. Take the CDL Practice Test. Many consider the profession of a truck driver to be more of a lifestyle than anything else. Your first year on the road as a truck driver will be one of the hardest you will face. It’s a time of adjustment to this new job, or lifestyle, that you’ve chosen. Your limits will be tested, as will your patience. Whether it makes or breaks you, it’s all going to rest on your attitude toward it. There are both negatives and positives to this profession, for both the new and the long-haulers, and it’s important to know and understand the impact truck driving has on all aspects of your life. Chances are, you’ll spend around 300 days per year on the road. That’s only 65 days you will get to spend at home. It could take up to two years before becoming a regional driver, they are able to go home every week. However, the more time you spend driving, the more money you’ll earn. You must determine whether or not your personality is a good fit for the gig. You need to be patient, determined, independent, have a good work ethic, good judgement and intuition. You need to love adventure so if you’re a couch potato who is happier behind a desk, trucking wouldn’t be a good fit. Truck driving allows the driver to see parts of the US, Canada, and even Mexico that most people don’t even know exists. It’s no wonder that some truck drivers also become ‘professional tourists’, particularly the young ones who are not married with children! Because trucking is such a lifestyle, the cabins of trucks come with features to keep you, the truck driver, connected, such as smartphones, tablets, and video chat so keeping in contact with family and friends is always a click away. Not all truck stops are created equal. Some are nicer than others but definitely keep a pair of shower shoes packed, just in case. Truckers who have been on the road a long time know which stops to go to and which ones to avoid. It’s a learning curve and a right of passage for many truckers who are just starting out. There is so much sitting involved with driving it can cause staying healthy to become difficult. Boredom can cause you to eat your way through your drive. Stockpiling unhealthy snacks is not uncommon for truckers but it doesn’t have to be that way. Drivers can find creative ways to stay fit and healthy while doing their job. While the new trucks are luxurious and well-appointed, truck driving can be a very lonely lifestyle. Sure, there is a connection with the other drivers but it can get tiresome being away from home for extended periods of time. There is a 125,000 mile per year expectation put on truck drivers.This is roughly 500 miles a day, every working day, per year. Driving a truck is not a 9-5 job. Some choose to get an early morning start while others like to drive through the night. The hours are up to you, as long as you get to your destination on time while following the federal regulations. Liquid Hauling: Be prepared to haul hazardous waste as a liquid hauling driver. Salary starts out around $37,000 and the job requires a special endorsement under the CDL license in order to travel with hazardous materials. The federal government, under the Patriot Act, requires the driver to go through a security threat assessment due to the nature of the materials they will be hauling. The driver also needs to have a clean record, no felony convictions including espionage, treason, or any other crimes against humanity. Oversized Loads: To drive oversized loads, the driver must have specialty training and hold a special license. The trucks are double-sized because so is the load they are carrying. This results in better pay. They can earn over $53,000 per year. Ice Road Trucking: Hey, there’s even a reality show about this type of trucking. As seen on t.v., Ice road trucking can be dangerous but it pays well. Some get paid $120,000 and that’s just for working a couple months per year. But, they face extreme conditions such as sub-zero temperatures, whiteouts, and crazy insane road conditions. It can take awhile to become an IRT because there are so many applicants and jobs fill quickly so patience is a virtue! There is no special training involved with becoming an Ice Road Trucker. Over The Road (OTR) Trucking: OTR truckers can earn over $70,000 plus bonuses annually. But, they travel long distances, work a ton of hours, and are away from home a lot. OTR Trucking is considered one of the best trucking jobs. However, the driver must understand that for most of the year, his truck is his home so great personal sacrifices must willingly be made. They deliver freight throughout the United States and even into Canada. Specialty Car Hauler: This is a niche that can prove difficult to get into. Hands-on-training is required because trucking schools do not provide education in this specialized area. Transporting luxury cars or damaged cars is part of the job, which pays fairly well. Indeed.com shows the average salary for specialty car haulers is $82,000 annually. Dump Truck Driver: Mostly working on construction sites, dump truck drivers transport loose materials in an open-bed truck. They can also be found working at mines, and storage facilities. Coal, gravel, sand, and crushed rock are their passengers. Their average salary rocks a little over $40,000 annually. Team Driving: Sometimes, working as a team is more efficient. And, that holds true with team driving, as long as you’re partnered with the right person. Working as a team can bring in a few thousand dollars more per year than driving solo. When there are two drivers to one truck, the federal regulations don’t hold as much clout because driving time is broken up so jobs can be completed quicker. This makes room for being able to pick up even more jobs in the same amount of time it would take one driver to get one assignment done. On average, team drivers split salaries of $50,000-$90,000. But the potential to earn more is greater when there are two bodies switching seats. Food Service Drivers: Just like it sounds, food service drivers deliver to restaurants, supermarkets, and other food related industries. These drivers get to go home every night and still earn an annual salary of over $60,000. Drivers in the food service have a physically demanding job because they have to unload their own trucks. So, it’s best to be in great shape in order to sustain this type of job. Truck driving can be one of the most interesting, rewarding and well-paying careers. It takes time to get acclimated but, once you do, you’ll be part of a brotherhood (or sisterhood) unlike any other. There are a large number of truck driving schools available and it can be difficult to weed out which one is a good fit. There are a few factors to consider when choosing the right school for you. Make sure the school is accredited and licensed and find out how long they’ve been so. What is their pass/fail rate both for class and the exam. Do they have job placement or is that on the student. Do they prepare their students for all the varying conditions, such as interstate travel and beyond. Are they 3rd party testers. Is the ratio of student to instructor 1:4. Any more than four students to one instructor is too much. Free online schools aren’t necessarily free so find out about hidden costs. Also, make sure they aren’t a scam. Many of them are. Avoid Mom and Pop operations! Schooling costs around $3000 minimally. Some are over $5000. Usually the cost includes everything the student will need, from the exam to licensing. Scholarships and grants are available through some schools so check with the administration office to see if there are any offered at your school of choice. Because of the shortage of drivers, some trucking companies will offer tuition reimbursement to their new hires so if you’ve already been hired, find out if they have a tuition reimbursement program. There are three different types of CDL licenses beyond the main one. The Class A license will allow the driver to get behind the wheel of tractor trailers or anything that carries over 26,001 pounds. A Class B license is for drivers to carry cargo up to 26,000 pounds. And Class C license is for carrying hazardous materials, and larger passenger trucks. The endorsements letters are “H” for hazardous materials, “N” for tankers, and “X” for both and are placed on the CDL license once the driver is qualified. Employment for truck driving careers is expected to grow 6 percent through 2026. While that may be the average for most careers, there is a high demand for truckers who can transport goods across the country. The average age for truckers actively working in the United States, at this very moment, is 49. This means that retirement is in their very near future and the trucking industry is shaking in their boots because there aren’t enough newcomers to fill those trucks that are about to be vacant. According to the American Trucking Association, there is a significant deficit of 48,000 drivers in the US. This number will only increase, potentially reaching 113,800 by 2026 if there isn’t a surge of qualified drivers looking for employment. With the median pay for truckers falling in at over $40,000 a year, trucking is proving to be a very underrated and overlooked career choice. According to Indeed.com, student and beginner truckers will bring in between $30,000-$41,000. But, seasoned professionals who have been in the business for a while make an average salary of $62,010, according to the Bureau of Labor Statistics. Some drivers will make much more than that. Truckers are paid by how many miles they put in, along with some nice bonuses such as a percentage of the revenue from shipping. Their pay will vary by employer along with what they are transporting combined with the amount of experience they have as drivers. In recent years, truck drivers have been seeing an 8%-12% increase in starting pay where many other professions have remained stagnant. Many trucking companies need drivers so desperately that they are offering exceptional sign-on packages completed with higher salaries and better bonuses. With the newer federal regulations put in place for the safety of truck drivers, they are only allowed to drive a maximum of 60 hours in a week, or 70 hours in eight days. Between each shift, the driver must take off 10 hours for rest time, which has tremendously cut down on truck related accidents due to exhausted drivers. Truckers are expected to take a minimum of 34 hours off before starting their next seven to eight day shift.